Managing a child’s asthma can be tough and especially hard for busy parents. Improve compliance and lower costs by providing your patient families with practical tips, support, and timely reminders with KidsHealth’s new text-based program. Today’s parents text! 97% of 18- to 29-year-olds and 94% of 30- to 49-year-olds text message. Households making less than $30,000 a year text twice as much as households making more than $75,000 a year. Hispanics text 1.56 times more than Caucasians, and African Americans text 2.24 times more than Caucasians. 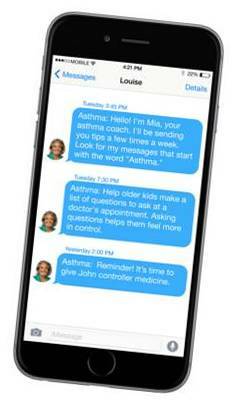 Medicaid patients (79%) are more likely to use text messages than privately insured individuals (65%-68%).